What Can the Executor of a Will Legally Do in Pennsylvania? An executor is the person named in a will who handles the estate of a deceased person, called the "testator." Usually, the testator names a spouse, adult child, friend or relative as executor. If the primary named executor cannot serve, most wills name one or more alternates. In Pennsylvania, as in other states, the executor must perform certain duties to settle the estate, including determining its value, paying debts and taxes, and distributing the remaining assets according to the decedent’s wishes. The letters testamentary and Pennsylvania law describe the legal actions available to the executor of an estate. In Pennsylvania, an executor must submit a will to the Register of Wills in the county where the testator resided. If the will is determined to be valid, the Register of Wills issues letters testamentary to the executor. This document gives the executor the authority to act on behalf of the estate. 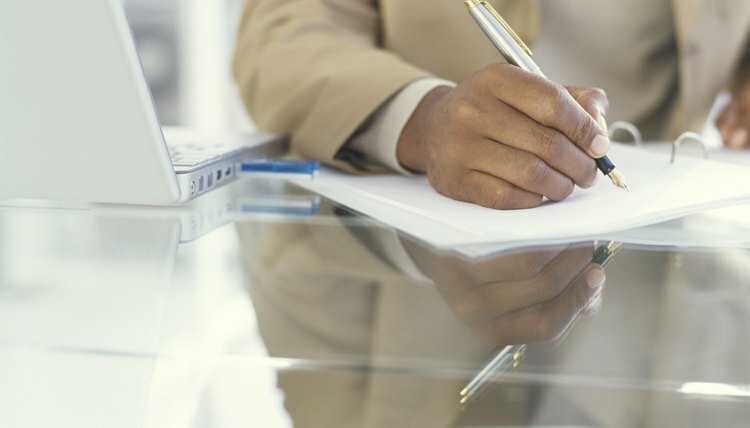 The executor must provide copies of the letters testamentary to the testator’s bank, business accounts and taxing authorities to prove that he is authorized to conduct business on behalf of the estate. The executor of the estate must draft and submit an inventory of assets to the Register of Wills within nine months of the decedent’s death. To accomplish this task, the executor gathers information about the estate assets, including bank accounts, stocks and bonds, real estate documents, vehicle titles and other proof of ownership. The documentation is submitted to an appraiser or other experts to determine the market value of the assets. Cash and other liquid assets are transferred into an estate account for payment of debts. Soon after beginning to handle the estate, an executor in Pennsylvania must notify the beneficiaries that they have been named in the will. If any of the beneficiaries were left a specific amount of money or a particular property, the executor may distribute those assets after determining that the estate contains sufficient assets to pay the debts and taxes. Gifts representing a percentage of the estate, called general bequests, are distributed after the final accounting. The executor uses estate assets to pay for funeral expenses, medical bills, administrative fees and reasonable debts. The executor must also file applicable tax returns, including a Pennsylvania inheritance tax return and federal estate return, within nine months following the testator’s death. State inheritance tax and federal estate taxes are computed on the adjusted gross value of the estate after deducting debt payments, funeral expenses, attorney's fees, payments to the executor and a family allowance. To conclude the estate in Pennsylvania, the executor prepares an accounting and a schedule of distribution for the beneficiary and the Register of Wills. If the beneficiaries agree with the plan for distribution, the estate can be distributed without the need for an audit. If disagreements arise, however, the Orphan's Court will issue an order after a formal audit has been conducted. If the estate must pay taxes, the executor will do so out of assets from the estate. Probate is the court-monitored process of settling a deceased person’s estate. When the deceased individual has a will, he is called the testator. In Florida, the probate court will oversee the gathering of a testator’s assets, paying of his debts and distribution of his assets to will beneficiaries. In Florida, this closely-monitored probate process is called formal administration. Washington, D.C. has enacted the Uniform Probate Code, a law drafted by the National Conference of Commissioners on Uniform State Laws that is designed to harmonize the probate laws of the various states. The Uniform Probate Code governs the distribution of inheritances bequeathed by people who resided in the District of Columbia when they died.